This describes my frustrations and process to install Windows XP Professional in my Dell Inspiron 7500 Notebook. Use the information contained herein at your own risk. In Win 98Se I ran dual monitor extended desktop, 1400x1050 16 bit color in both displays. It worked fine. I have come to be dependent on the two-screen wide desktop, it's really a plus for me. I liked it so much that built a desktop system with a dual-head video card so I could have another computer with a "double-wide" screen. I installed XP Pro in my Inspiron 7500, using the new Dell XP Video driver, R48642.EXE. XP works fine, but I found that the video driver doesn't work at 1400x1050! The new Dell driver for XP on the 7500 does not support my desired extended desktop configuration that I enjoyed with the previous driver under Win98Se. The new driver supports resolutions up to 1600x1200 for a non-extended desktop (single monitor). However, whenever the desktop is extended into the second monitor, both monitors go down to 1024x768! 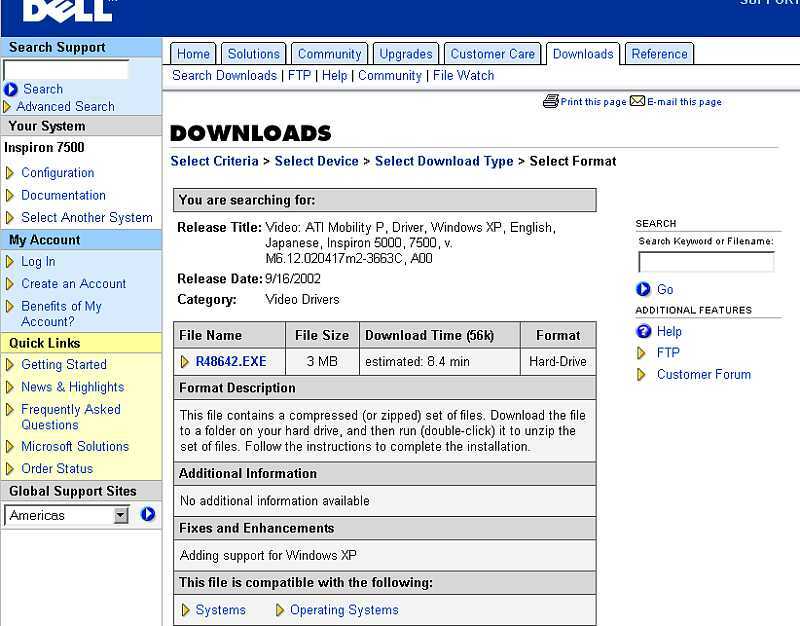 A Dell statement in the Dell forum indicates that Dell does not support XP on a 7500, but the Dell driver download web pages clearly indicate that the R48642.EXE file was "Adding support for Windows XP". Maybe so, but not full support. 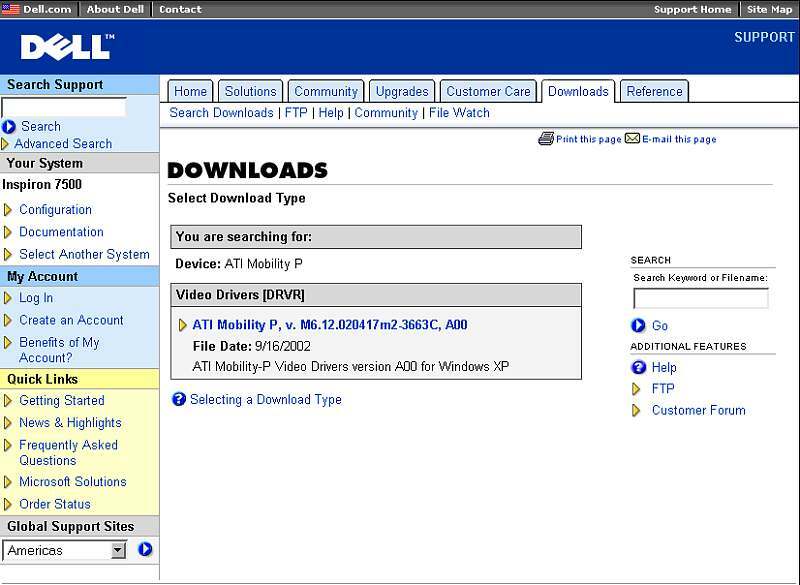 Here's the Dell Download pages with the Dell reference to Windows XP for the Inspiron 7500 (ATI Mobility P video). These displays are included to call attention to the Dell statement that this driver is for the Inspiron 7500 running Windows XP. Unfortunately, as described previously, this Dell R48642.EXE driver doesn't support the Inspiron 7500 extended desktop in XP in 1400x1050 resolution, even though Dell clearly claims the file is compatible. The R48642.EXE file installs Driver version 6.13.0.10.5795 ("5795") dated 4/17/2002. Research on the web and in the Dell forums found two other drivers to try. First, I tried the "5772" driver, courtesy of "stonent", a Dell forum regular. Here's a link to his page. Even though this was an earlier version of the driver, it was a bit better. However, I couldn't find a way to use 1400x1050 on both monitors of an extended desktop configuration, what Win98Se provided. The other driver I found was a Compaq driver, "5779" (links provided below), that allowed me to get the extended desktop working with 1400x1050 16 bit on each screen, finally emulating what I had in Win98Se. However, for the 1400x1050 resolution, the "primary" monitor now must be the external CRT! The internal flat panel must be the extended part of the desktop. I can use the new configuration, but I have no idea WHY this switch is necessary. I cannot force the primary monitor back to the internal flat panel monitor and maintain the 1400x1050 displays. This makes for a lot of problems when I use the notebook without a second monitor, because everything is "displayed" on the monitor that isn't connected. By the way, Alt-space gives a context menu that allows "off screen" menus to be moved back on screen; a workaround, but it is a real pain. Using the Compaq driver, when I try to use the built-in flat panel as the primary display, then the desktop on the CRT display is "bigger than the monitor screen" and scrolls to show the "rest of the screen" when the mouse pointer is run to the edge of the display. You only see a (magnified) portion of the desktop on the CRT screen. Not really a usable condition, so I don't use it that way. Further, I can't reduce the display resolution like I could with the Win98Se driver. I would like to be able to switch to resolutions that render larger characters, as I could in Win98Se. The Compaq driver seems to only work at 1400x1050 when the extended desktop is enabled. But at least the Compaq driver lets me upgrade to XP, even if I lose some capability. Thanks, Compaq, it's really appreciated! The bottom line is that the Compaq driver, with an earlier version number than the Dell driver, proves that extended operation is possible with XP and with both monitors running 1400x1050. However, the Dell XP driver works fine at 1024x768 extended; above that it gives up. Why won't the Dell driver work at higher resolutions? Hopefully Dell will work with ATI to enable the higher resolutions in the XP monitor like Compaq. Hopefully the Dell forum statement is mistaken, and Dell will make an effort to fully support its customers who own Inspiron 7500 notebooks and want to use them as I wish to use mine. However, if Dell doesn't intend to fully support XP on my Inspiron 7500, I'm really disappointed in Dell; Is this is the support I can expect in five years for a new Dell system I buy today? Is Compaq (HP) doing better? Having said that, here's how I installed XP Pro on my Dell Inspiron 7500 using the Compaq extended desktop video driver. This write-up ignores the generic XP steps and ignores XP issues that don't specifically apply to the Dell Inspiron 7500. This is a bit convoluted, but it does work and it's repeatable. I've also found that this works if either the Dell R48642.EXE (5795) driver or the 5772 driver are in place before running the SP18896.exe program to install 5779 (see below). First I did a clean install of XP Pro to a freshly formatted C drive, and updated to add service pack 1 (and many other MS XP updates). I set Display Properties to 1400x1050 24 bit color. One setting was for both the internal (LCD) and external (CRT) monitors. Note: Display Properties|Settings| only shows one monitor, not two. Both monitors display the same information and the CRT (but not the LCD) must be "scrolled" to display the entire screen. This will get the file SP18896.exe. It is intended for a Compaq Armada 500E, not the Dell Inspiron 7500. I ran SP18896.exe to extract the files from the archive, then I ran setup.exe, one of the extracted files. Display Properties|Settings| now shows two monitors. It says both monitors are "(Multiple Monitors) on ATI RAGE MOBILITY AGP". Monitor 1 is the Primary Display; Monitor 2 is not active. The key combination Fn and F8 switches the monitors through the sequence | both monitors | internal monitor only |external monitor only |both monitors| etc. Press Fn & F8 together twice: Now the primary monitor is the external CRT and the internal flat panel LCD is dark. Note that when the LCD is dark, that the display on the CRT is full size and doesn't need to be scrolled to see it all. Display Properties|Settings| Change Monitor 1 to 1400x1050, 16 bit, apply. Display Properties|Settings|Change monitor 2 to 1400x1050 16 bit, Check "Extend my Windows desktop onto this monitor." Apply. In |Display Properties|Settings| there is a display that shows monitors 1 and 2. Press the "Identify" button to identify the monitors. The two monitor icons may be "dragged and dropped" to change their relative position; monitor 1 can be left, right, above or below monitor 2. Move the icons to represent your setup and press "Apply". If you need to change this in the future, you must uncheck the "extend" box and apply the change. Then you can move the monitors around and recheck the extend box. Note: If you restart the computer now (don't do it! ), you will have to uncheck "extend the desktop" and start over with the Fn+F8 process, because XP doesn't remember what was just done. The next step causes the computer to "remember" so the setup doesn't have to be done on each restart. I have noted that I can set my external CRT display to 1600x1200, and it seems to be fine, but somewhat difficult to read due to the small print. You may find this useful. An XP observation: I hear two loud pops in speakers as XP boots up; not so with 98Se. The first pop is the loudest. Not present in Win95 or Win98Se. Please let me know if you find a cure for the pops! I hope you find this useful. Please let me know if you find any errors. And, if you find a way around the shortcomings of the non-Dell substitute XP video driver, please let me know. And most of all, Dell? When will I hear from you that you have, with ATI, have updated the driver so I can run 1400x1050 extended in XP with a Dell driver?